MOGADISHU , Sep 6 2013 (IPS) - The system of government remains the biggest political obstacle in Somalia as key political players boycotted the government’s current national conference to discuss this country’s political future, according to Jaylani Mukhtar, a local academic based in capital Mogadishu. “I think Somalis do agree much about their future. But the issue of federalism is what we will mark as the biggest political obstacle facing the country, and the current conference will have much to debate about it,” Mukhtar told IPS. On Sep. 2, the Somali Federal Government’s five-day conference began with an agenda to discuss key issues, which include implementing federalism, reforming the constitution and conducting elections in 2016 when the government’s term of office ends. But representatives from many of this Horn of Africa’s breakaway states did not attend. The northeastern semi-autonomous state of Puntland said it would not attend the conference and accused the Somali government of “tampering” with the national constitution. It is a claim denied by Somali parliament speaker Osman Jawari. The breakaway republic of Somaliland, in the northwest of the country, also did not send official representation to the conference. Mohamed Jama, one of the organisers of the conference, said the meeting was not meant to represent the regional states but had brought together “experts and the national intelligentsia” to chart a pathway for this country’s political future. “This was never meant to be a conference where various groups, whether they be regional states or political factions, record their stances, but a platform for Somalia experts, intelligentsia and the general public to discuss and debate about the country’s future direction politically,” Jama told IPS. He said after deliberation and discussion on the various issues, conference participants would present recommendations to the government. But the exclusion of key players in the current debate is similar to the previous government’s handling of the issue of federalism, always a divisive subject in Somalia. The issue of giving member states autonomy over regional affairs, but still holding them subject to the authority of the government, has been praised by some as a solution to the two decades of civil conflict here. Others say that such a political system could further escalate the conflict by encouraging clan-based mini states. Somalia’s former and interim Transitional Federal Government, which ended its mandate in August 2012, had agreed with regional states and local factions in central and southern Somalia that the country would adopt a federal system of government. But Mukhtar said that the agreement had been among political leaders, and the Somali people had not been given a chance to vote on it. He said that it was a constitutional issue that was yet to be endorsed by the people. “The problem is that the issue was just a political agreement and not a constitutional one because such an arrangement and how we implement federalism will be decided by the people when given the chance to have their say,” Mukhtar said. 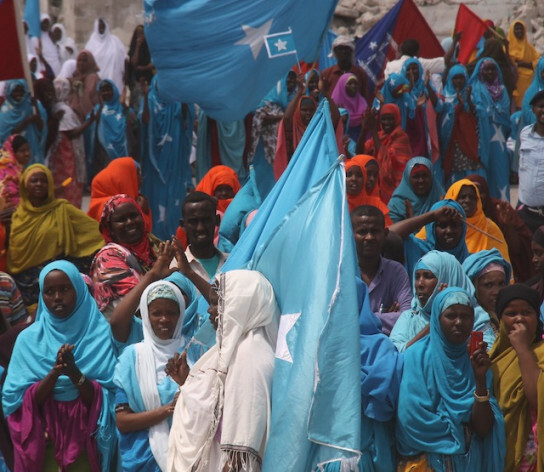 Ahmed Daahir, a political analyst from the northern Somalia town of Bossaso, in Puntland, said federalism in Somalia could be a way to bring the government to the people. “We have been governed directly from Mogadishu for many years, since independence actually, and that has brought destruction and state collapse. So what the people are saying is let’s empower citizens by having federated states,” Daahir told IPS. The most recent breakaway state here is the semi-autonomous state of Jubbaland in southern Somalia. In May, local militia known as Ras Kamboni declared the three southern border provinces of Lower Jubba, Middle Jubba and Gedo as the state of Jubbaland and elected their leader, Ahmed Mohamed Islam, better known as Sheikh Madobe, as president. The leaders argued that the constitution gave them the right to form the state, but government officials said the new state was not inclusive of all clans in the provinces and this could lead to bloodshed. After Ethiopian mediation, the Somali government struck a deal with the regional leaders to institute a two-year interim administration for the breakaway state. The agreement was seen as test of the government’s leadership. But the practicality of federalism in Somalia was rejected by many of the clans in Jubbaland who were not represented in the peace talks. Many saw the agreement as the government giving the leadership of the regions to Ras Kamboni, thereby ignoring the rights of other clans in the area. “The Addis Ababa Agreement has shown us that to some federalism means a mini-state for one’s clan within Somalia, even at the expense and exclusion of others,” Mukhtar said. He said that other autonomous states have “organically grown” in Somalia, such as the breakaway republic of Somaliland, and the self-autonomous state of Puntland in the northeast. There are also the breakaway states of Galmudug, as well as the Himin and Heeb states in central Somalia. These states are also clan-based “in various degrees” from being pure single-clan entities to being quasi multi-clan states. As the debate rages at the national conference over the future political make-up of the country, Daahir fears that it will further the deep distrust among Somalis. “What we need in Somalia more than anything now is real and genuine reconciliation to heal the wounds of the past three decades then and only then can we have meaningful discussion about the future of this country,” he said.